Illuminate has been facing an uncertain future in challenging economic times, so a group of people have joined together to form a Charitable Trust which will aim to guarantee the prosperity of the venture. Illuminate is more than a bookshop, more than a coffee shop and more than home to two Christian charities. Illuminate is a light on the high street, a Christian presence in the centre of our town and a shop with a different ‘spirit’. Action is needed to keep the ministry going. So the Illuminate Trust will take on the management and running of Illuminate, but £60,000 needs to be raised by 9th July to achieve this objective. The Trust is selling non-profit shares at £50 each, giving each shareholder a stake and a voice in how the ministry is run and people are invited to keep this exciting venture alive and the light shining. 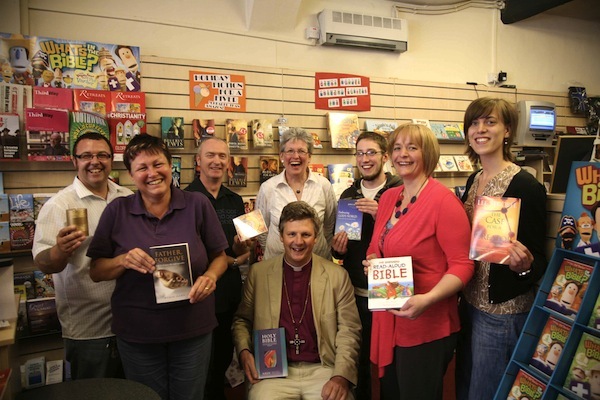 Illuminate is Shropshire’s major Christian Resource centre. As such it needs supporting. It stocks a large range of books, children’s material, CDs, DVDs, cards and gifts so it is essential that we support this superb shop. Please contact Illuminate on 01743 233657 or visit the shop in person for more information or to find out how you can help the Trust and/or purchase shares. Now that is the kind of support that is spiritual mentoring in action and fantastic to see. It is great to know you have the support of your local Bishop, here in Lincoln Bishop John has been a really great supporter of the shop and I have been very grateful for this indeed. Is this the Mark Rylands that attended Durham University when the student teachers from Penn State, Heidi and Mary Ann were there?